An hour of screen time immediately before bed is fine for most teenagers, according to research by an Australian university. But two hours is too much and likely to disrupt their sleep, said Associate Professor Michael Gradisar, a clinical psychologist at Flinders University in Adelaide. 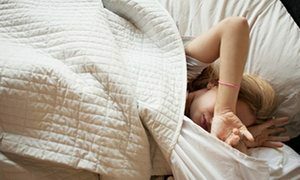 He said a review of four years of studies at the university and around the world showed moderate technology use is not as harmful for adolescent sleep as many health professionals and parents believe. “Experiments with video games show that if you give an experienced gamer a violent game before bed, their heart rate is not elevated and they sleep quite fine,” Gradisar said. It appears as if they have adjusted to using technology, he said. A more common reason is anxiety or “body clock mistiming“, which is similar to what happens when a person has jet lag. However, the Australasian Sleep Association said it was still best for teenagers to avoid technology for at least an hour before bed. “Sleep is a complex biological process and further research is needed to translate the findings of this research into a recommendation,“ said a spokesman, Sadasivam Suresh, a paediatric sleep specialist.